I’m delighted and honoured that Art Sung- Alma Mahler, has been invited to be the Grand Finale at the Festival of Music, Art and Literature, 2018 at St John’s Catford this Saturday evening. 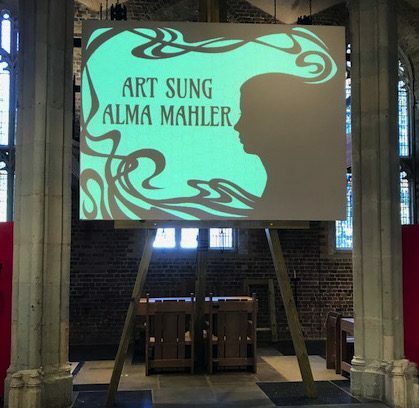 Alma Mahler, the beautiful wife of the famous composer Gustav Mahler, takes centre stage to tell her story through her passionate and heartfelt diary entries and a background of stunning artwork from 1900’s Vienna, projected onto a giant easel. Alma’s songs are at the heart of this recital, alongside music by Mahler, Zemlinsky, Wagner, Schumann and Beethoven. The performance opens with Alma describing an illicit kiss with the artist Klimt, his famous painting ‘Der Kuss’ is shown, and the song ‘Der Kuss’ by Beethoven is sung. The scene is set…. Joining me to perform Art Sung – Alma Mahler will be soprano Alexandra Weaver, baritone Jon Stainsby, and actress Sandy Walsh.